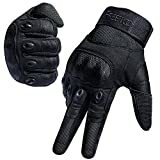 The list curated below – of the top 10 best hard knuckle gloves – offer unparalleled protection to your hands. What’s more, they are breathable, comfortable, and give your fingers maximum movement, doing away with the “club-hands” feeling. With these, your hands will remain in top shape whatever the activity or weather. 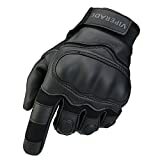 Viperade mens tactical gloves are designed to ensure that your hands are safe however aggressive the activities you engage in. It comes in two color choices, black and green so selection won’t be hard. The knuckle protector is made of non-toxic hard rubber to give your hand maximum dexterity. The rest of the material is artificial leather and fabric. The palm is reinforced and has adjustable wrists with a Velcro design to simply putting them on and off. The additional palm protection ensures that you have a better grip on your equipment, so nothing can slip as you hold it. However, some people may find it too thick to handle firearms with them on. On the downside, these gloves aren’t really the go-to option if you are looking for protection against the elements. Anything above 80 degrees and your hands will sweat. Anything below 50 and they will freeze. But for mild cold temps and springtime, these are the best to use. JIUSY tactical gloves are made of artificial leather and nylon. The use of leather gives it its wear-resistant and anti-slip qualities. The nylon improves breathability and dries fast, so you can wash it a couple of minutes before wearing it. Instead of just the index finger, or the index and the middle finger, these hard knuckle gloves go an extra step and include the touch screen functionality on the ring finger. This makes using your phone more convenient. It is lightweight and gives your hand and fingers room to move, almost as if you don’t have them on. It is double-stitched for increased durability. You can adjust the fit on your wrists using the strong Velcro strap. The top of the glove is made with a hard rubber knuckle to cushion the impact you will feel on your hands. The palm has no thick padding like most other hard-knuckle gloves but is just enough to keep your hands safe and prevent stuff from slipping through your grip. It is available in three colors: black, green, and brown. A good pair of gloves is that which is not only solid but also easy to wear. These two are important to prevent you from losing your dexterity or hurting yourself. These Accmor tactical hard-knuckle gloves are the perfect blend of smoothness and stiffness for comfort and protection respectively. They are very well made with synthetic fabrics and double stitched for durability. The fabrics used, and the finger vents allow some air to pass through for breathability. This will ensure that your hand remains dry even in warmer temperatures. This pair of hard-knuckle gloves is made of hard rubber. Though the not as solid as most in this list, it is still serviceable. The palm is reinforced to reduce the risk of something slipping through your grip. As the name suggests, these gloves are only available in half-finger models. This, while it leaves your fingers free to operate your phone among other things, makes it unusable for a number of activities — e.g camping. This fingerless design makes them stylish and affordable. They are available in a selection of colors that include green, sandy and black. They are perfect for motorbike riding and don’t come with too much padding. The fingers have ventilation ports and its design makes use of microfiber to improve on breathability. Most of its parts are made of leather and are wear resistant. Most of the fingerless gloves are too tight around the finger area, making it a hassle to take them off. The Accmor half finger gloves have enough room to grab and pull them off. The package is shipped fast, and the moment you unpack them, you will notice no odor as is with other gloves. The hard knuckle part is made of hard rubber instead of plastic and it has a reinforced palm to form a tighter grip. The use of rubber makes it more flexible that it would have been had it made use of plastic. The rest of the unit is made of nylon and microfiber material to make them comfortable and durable. These materials make it breathable so you won’t sweat however hot the climate gets. However, there is a catch: these gloves aren’t the best options if you are looking for something to protect you from the cold. In low temperatures, your hands will freeze. These best hard knuckle gloves can be used in water or washed before use as they dry very quickly. More interestingly, the tips of the fingers are touch-screen enabled. You won’t have to remove them to access your smartphone. Mechanix Wear has been gracing us with their products for quite a while now. So good are their products that it is almost impossible to mention their name without bringing out the notion of quality. 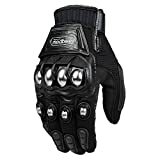 The M-Pact 3 tactical gloves are designed to offer maximum hand protection while giving you all the dexterity you need. The hard knuckle area is made of a dense thermal plastic rubber to absorb most, if not all, of the impact against your hand. The back of the fingers is reinforced with a 3mm EVA padding to help absorb the impact. Inside the fingertip area, the glove has been reinforced to prevent abrasion during extreme activities. The palm is reinforced with an embossed pattern to increase your grip. If you are one to base your purchases on ratings and reviews, you will be glad to know that the TitanOps hard knuckle gloves have one of the highest ratings in most review sites. The reasons for this mostly lie around the ability to find on that meets not only your needs but also your preferences. There are three different sizes from which to pick from: large, medium, and extra-large. If you want half-finger gloves for certain activities and full-finger ones for other activities, TitanOps has got you covered. These hard knuckle gloves are available in both the full and half-finger designs. Moreover, there are three color options: black, tan, and green. With these, you are able to match your personal style without sacrificing protection. They are made of a nice blend of lycra, microfiber, nylon, and leather to make them machine washable and quick drying. Into it, a spandex fabric is woven to allow it to stretch to the shape of your hand for a snug fit. This is enhanced by the adjustable strap at the wrist. The materials used are double stitched for added durability. The hard knuckle part is made of heavy rubber and is capable of absorbing even the strongest of impacts. These other best knuckle gloves stand out from the rest in form and, to some extent, function. Right from when you unpack them, just the mere sight promises you complete protection and durability. Instead of going the conventional way and using hard rubber or plastic at the hard knuckle area, the ILM come with alloy steel knuckles. If rubber offers good protection, how do you think steel will perform? Excellent! A hundred percent protection against impact is guaranteed. The back of the glove features U-type protection, with an arch shape. This accommodates the back of your hand and leaves some room for breathability. They are arguably the best option for extreme sports and other aggressive activities. The palm is reinforced with 3D plastic lines that do not slip to strengthen your grip. There are four size options from which to pick from and a wide selection of colors. With ILM, you will never go out of style. Mechanix Wear is known for their quality products, so you shouldn’t expect any different with the M-Pact Covert Tactical gloves. It is these exact knuckle gloves, featuring in the movie “American Sniper”. They come with a 0.88 mm leather palm. This enhances the durability of these gloves while ensuring that nothing slips from your grip. More, they feel almost completely natural when you have them on as they offer a wide motion range. The TrekDry material used is double reinforced for durability. This material is used all over the glove to give it maximum breathability and comfort. That said, they use in hot climates without sweating or discomfort. More, they are handy in a number of situations and settings such as hand to hand combat or defense against predators. These gloves can also be used in climbing excursions. The Freetoo tactical gloves are the best hard knuckle gloves’ option for aggressive everyday use thanks to their durability. They are made of the high-quality materials – combining breathable spandex with a double-layer synthetic leather. This ensures that your hands remain dry in hot weather. This function is enhanced by the finger vents that ventilate the insides. The palms are well padded using leather to prevent slippage when holding an item. The hard knuckle part is made of thick foam and the insides are well padded. With these, even if you punch a wall, you may feel a little pain, but you won’t be injured. They are available in four sizes so you are assured of a snug fit. What’s more, the adjustable velcro strap at the wrist ensures that even if you don’t find the perfect size for you, going for a larger one will deliver the same level of functionality. There are several colors from which to choose from to match different tastes and uses. It is available in both full fingered and half finger models. When it comes to tactical gear, having a few high-standard options as the above is just not enough. You need to narrow it down to the one that especially meets your needs. Assuming you already have a couple of selections from the above, running them through the following few factors will have you with the right selection soon as you are done. This is arguably the most important factor to consider. A glove is technically useless if it hinders the ability to hold your firearm well. It is for this reason that most people tend to go for the fingerless models as they protect their hands while giving them the ability to operate phones and other tactical devices. Some of the full-fingered options above have touch screen capability so they are the best for cold conditions. If you plan on using your gloves for climbing, make sure it has an added grip, as made possible by the textured palm. The only way to have complete mobility of your hand and fingers is to find a glove that fits like.. well, like a glove. It shouldn’t have too much padding that can get in the way, and the hard knuckle part shouldn’t be too thick as to impede movement. It should feel natural and not too tight nor too big. The level of insulation is determined by the amount of padding. Proper insulation is important as it keeps your hands warm during cold days for comfort and full performance. This insulation shouldn’t also be too much that it gets in the way of movement. There are a few basic materials for making gloves. They include nylon blends and leather exteriors. While each of them can work well, it is important to find one that has the best blend of both worlds. For instance, it should have just enough leather for durability, waterproofing, and contouring. This should be combined with the right amount of nylon blends for breathability. There are times when one just can’t do without tactical gloves. As the above reviews show, you have a number of options from which to pick from. If you run into any qualms, you can refer to the above buying guide to know what features to look for.